Many of you have suggested that you would like to read recipes of what I cook at home. Granted, as I’ve explained in posts before, I’m not good at the “ready in 20 minutes for dinner” kind of cooking. I’m much more about the “all day, from scratch, making grandma Toscano’s brajoile” kind of cooking. To my surprise, that seems to interest a great many of you, so I’ve decided to begin to post some family recipes. In some cases modified slightly to not give away all our family secrets. My first recipe is actually very simple and not at all time-consuming, unlike many of the others to follow. 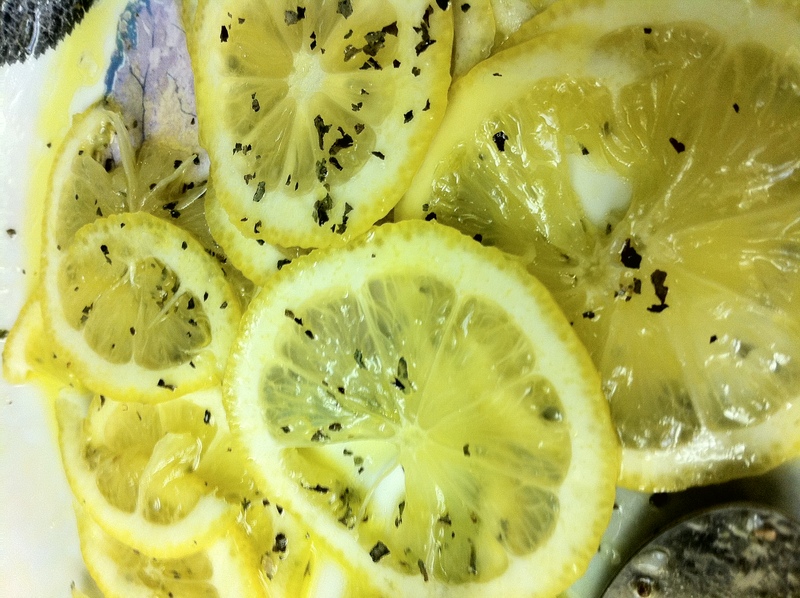 Thinly slice the lemon, and lay slices on a plate, drizzle oil all over the slices. Add the chopped basil, salt, and sugar to taste. In my family we usually serve this as a side salad to whatever the main dish is, usually our famous broccoli pasta, a recipe I will be posting shortly.